In July, 2010, the Bolognese painter was invited to exhibit his works at the 61st edition of the Michetti Award, the acclaimed international review of contemporary art that has been held every year since 1947 in the Michetti Museum. In November 2010, Andrea Benetti's Neo Cave Painting was shown at Palazzo Taverna (Rome), in the Legal Archives of Amedeo Modigliani, alongside the works of Giorgio De Chirico, Amedeo Modigliani, Andy Warhol, Keith Haring, Mario Schifano, Max Jacobs, Carlo Corsi, Jules Pascin, Guido Cadorin in a show called “Portraits d'artistes”, curated by the President of the Modigliani archives, professor Christian Parisot and professor Pierfrancesco Pensosi. the project was presented to the press and television by critic Vittorio Sgarbi. At the same time of the show in Rome, and within the United Nations' program "Academic impact", the representative of Italy, Istituto Europeo Pegaso, donated Andrea Benetti's piece,"Against violence" to the permanent collection of the United Nations Headquarters. In May 2011, Benetti was invited by Salento University, School of Cultural Heritage to hold a seminar on Neo Cave Painting for the students of History of Contemporary Art presented by professor Massimo Guastella. In September 2011 Benetti's work was shown in the caves of Castellana, and the show was part of a program of research of contemporary art of the Cultural Heritage department of the University of Salento. 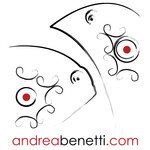 On March 9th 2012, an important watermark in Andrea Benetti's career was reached with e acquisition of one of his works into the Collezione d'Arte del Quirinale (The Italian Executive's art collection). This brilliant achievement came about by request of President Giorgio Napolitano with the full support of professor Louis Godart, councillor for the conservation of cultural heritage of the Quirinale (executive government). The presentation in the Palazzo della Presidenza della Repubblica and specifically in professor Louis Godart's private offices lasted more than an hour while the professor praised Andrea Benetti's commitment and artistic abilities, proving to be a fine connoisseur of Neo Cave Art. A few months later, in May 2012, another of Benetti’s paintings was accepted into the collection of the Museion, the ultra-futuristic museum of Modern and Contemporary Art in Bolzano, Italy. In November of the same year, Benetti was invited by Roma Tre University, to hold a seminar on Neo Cave Painting for the students of Education Sciences. In the same month, another of his paintings was included in the collections of the Vatican. In March 2013 three further paintings were accepted in important collections: the MamBo Museum in Bologna, the Chamber of Deputies in Montecitorio Palace, and the Argentine Ministry of Justice and Human Rights in Buenos Aires. Currently other acquisitions are in progress - one by the Ministry of Foreign Affairs. Benetti will paint a fresco on artificial rock in the entrance tunnel of the famous Frasassi caves, in the province of Ancona beginning in spring 2014. Collezione d'Arte delle Nazioni Unite (Palazzo di Vetro) New York, U.S.A.
United Nations Art Collection - New York, U.S.A.